Life is challenging, so the saying goes. And 2014 has provided many challenges for most. From microeconomic impact on the geo-political scene, to micro-financial issues for most lawyers and other small business folks, to family and health, change is the name of the game. In cycling, we hope you keep the rubber side down and on the road. May you remain upright, healthy and in good humor in 2015. All else will follow. Banks offer a variety of services that represent opportunities for a lawyer whose firm has established a good banking relationship. 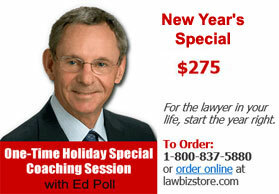 In addition, there are a variety of other services available for law firms. Credit Card Services. If you have the client’s credit card information and permission to charge his account, you will get paid more readily, improving cash flow. The few dollars that it costs you to get the money faster—typically 2 percent to 4 percent, depending on your volume, the card, and your ability to negotiate with your bank and processing agent—is offset by the ease and assurance of payment as well as the speed of collection. Office Services. Many banks offer services relating to functions such as staff payroll, pension administration, and even monthly billing and collection. Investment Instruments. Law firms can earn a return on cash balances not needed for operating purposes by placing the money into such short-term investment instruments as certificates of deposit, business money market accounts, commercial paper, or U.S. government obligations—all of which a bank can provide. Online Financial Services. These services can facilitate your cash management. For example, banks offer the opportunity to set minimum and maximum cash balances in a firm’s general account, with “extra” funds being transferred daily into interest-bearing accounts and cash advances being drawn from a line of credit if the general account falls below the minimum. As your needs develop and change over time, be sure to talk to your banker about the various types of assistance that the institution can provide for you.